Who is A.O. Smith? At home or at work, you come in contact every day with products made by A. O. Smith Corporation. They are the company that provides the hot water for your morning shower, whether you’re at home… or in a 500-room hotel! They help keep your home or office warm or cool with electric motors that power fans, blowers, and air conditioning compressors. Open a garage door or security gate… turn on your kitchen fan… or relax in your hot tub… chances are, you’ll find an A. O. Smith product hard at work. Thomas Curley Plumbing Features water heaters by A.O. Smith! 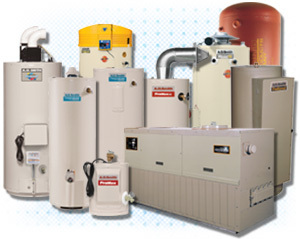 Genesis® commercial boilers with the industry’s most advanced electronic control systems The range of A. O. Smith residential and commercial water heater choices is unmatched. Their technological leadership is unchallenged. Their manufacturing network straddles the globe. At the end of the day, however, just like Curley Plumbing they judged solely by how well we serve every customer.QUESTION: Why Are A.O. Smith water heaters so special?ANSWER: A.O. Smith water heaters use C3 Technology™.The key differentiating elements of the C3 Technology design beyond the competition are:Only the Corderite Flame Arrestor is fireproof, will not retain or conduct heat, and will not warp! The C3 Technology design incorporates a Corderite flame arrestor that has very low thermal conductive properties. Only C3 Technology water heaters feature a scientifically designed lint, dust and oil screen, which can be easily inspected and cleaned. To prevent particles of lint, dust and oil from clogging the flame arrestor, C3 Technology water heaters are the only ones equipped with a removable LDO screen mounted in the combustion air inlet port at the bottom of the water heater. If LDO particles have accumulated, the screen can be easily removed and cleaned, using a soft cloth or warm soapy water. C3 Technology Gas Water Heater design simplifies parts replacement. friendly FVIR design on the market. And, of course, a design that saves us time ultimately saves you money. C3 Technology Gas Water Heaters are the only units that are Self-Resetting mean better performance for you! There are a number of conditions that can deprive a gas water heater of adequate make up air for combustion. These include improper installation, air exhaust situations from attic or other exhaust fans in operation, and LDO accumulation. These can prevent adequate make up air from reaching the burner in an “FVIR” gas water heater. When such conditions occur, the C3 Technology temperature sensor is self-resetting. In other words if the sensor detects poor combustion conditions, it shuts down the water heater. Then, once the water heater has cooled down, the sensor automatically re-sets itself. This allows the water heater to be easily restarted, after the cause of poor combustion is corrected. So if you are looking for the best most reliable and energy saving water heater available… A.O. Smith water heaters are the smart choice! Find out more about A O Smith here.